Contrary to popular belief, the paper wasp did not get its name by making its nest with actual paper. It does look a lot like paper, though. And in some cases, the nests look like gray concrete. What they are actually made of are plant bits and saliva. The paper wasp is generally brown. Some have a little bit of yellow which makes them look similar to the more aggressive yellow jacket. Where Will Paper Wasps Settle On Your Property? Paper wasps like building their nests in the corners of door frames and awnings, as well as deck furniture, swings, garages and eves. So, making sure these are kept closed or stowed when not in use helps prevent paper wasps around your home. They build in shady, warm, dry areas of a home without you knowing it until you see one. A sting from a paper wasp is very painful and if a person should have an allergic reaction, it could be deadly. Some of the most common places around the home they are called to are the top corners of front or backdoors. Storage sheds and other out-buildings are common problem spots, too. Once paper wasps are discovered, it becomes a fairly urgent operation to deal with. People don’t want to leave the wasps because they are dangerous. The risk of aggression by the wasp varies depending on the time of year and can also be greater during certain stages of their lifecycle. Why Do Wasps Love Our Homes? Wasps are very protective of their homes. They are strong but delicate, so it is imperative that they build their homes away from potentially harmful things like wind, rain and other elements that could damage their structure. Any damage to the nest endangers the larvae it was built to protect. Our homes provide ideal shelter for their homes. Do Wasps Only Sting Once? The wasp is feared because, unlike honey bees that sting once and die, a wasp of any kind can sting many times with no effect on its life. Paper wasps generally stay very close to their nest. They do not travel far and wide, so when you catch one in the home you will need to call Evergreen Pest Management of Newberg. Just the presence of one is an indication the nest is near. To a wasp, you are considered a threat to their home while in your home. So, to prevent physical harm and the hatching of many wasps the nest must be found and carefully removed immediately. Can I Collect A Paper Wasp Nest? If you discover a nest, regardless of how serene and abandoned it seems, do not attempt to remove it yourself. This is true of any wasp nest but this is especially so for paper wasp nests. 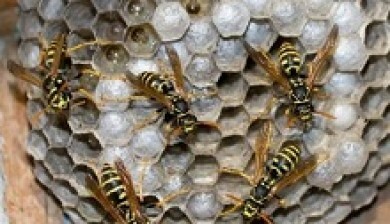 Their nests are more of an umbrella or tunnel unlike the honeycomb of other wasp nests where you can see the cells. This makes paper wasp nests seem quiet and harmless, yet they still pose a danger.